Introduced as part of Nike Baseball's Vapor Collection, Mike Trout's new Nike signature cleat has already surfaced in another colorway. This Lunar Vapor Trout is actually more Angels-friendly, and will be worn by the 5-tool sensation when Halos host the Texas Rangers tonight. 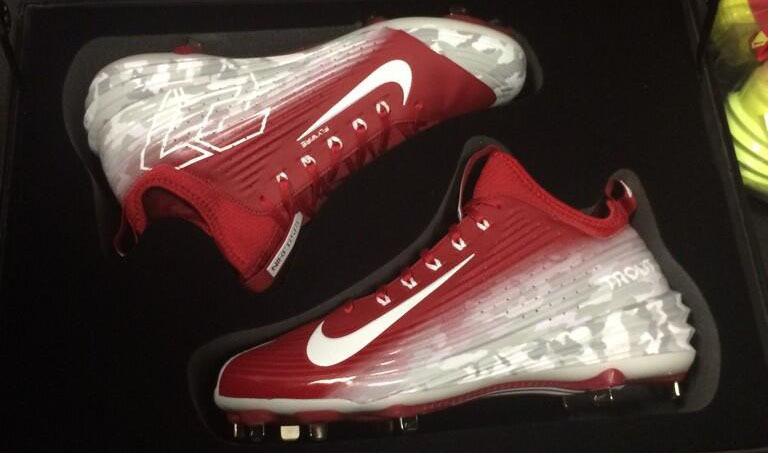 In addition to the simple red and white scheme, the cleats feature camouflage detailing and Trout's number '27' printed along the medial side. You can pre-order the Lunar Vapor Trout at nike.com in University Red/Volt now.